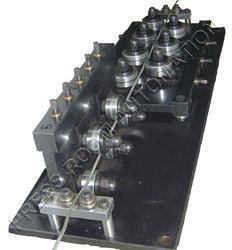 Pull - Through Wire Straightener is used for Straightening of wires & rectangular sections. 5 / 7 / 9 / 11 / 13 Rollers in two-axis depending on accuracy requirement. For Wire or Rectangular Sections. For feeding two wires or Rectangular Sections simultanious. Looking for Pull - Through Wire Straightener ?